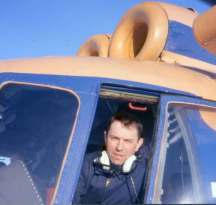 YellowAirplane.com: Christopher Pala, North Pole Explorer, Photos Pictures. Christopher Pala's North Pole Expedition Exhibit, Great Pictures of the North Pole. 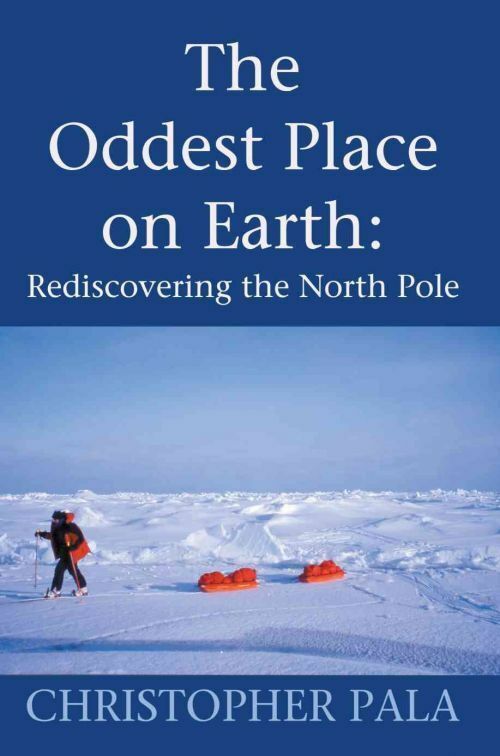 The Oddest Place on Earth: Rediscovering the North Pole with great North Pole Pictures. 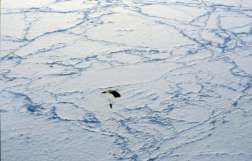 This Exhibit takes you over the ice, on the ice and under the ice of the North Pole. These are unique and exclusive pictures from Christopher Pala. 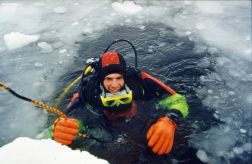 North Pole Expedition 2001. 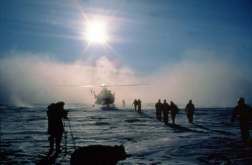 * North Pole Expedition 2002. 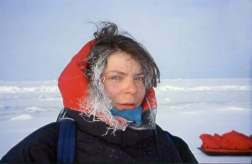 * North Pole Expedition 2003. 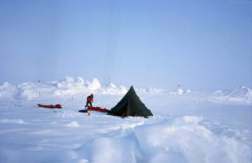 * North Pole Expedition 2005. Click Here for North Pole Adventure Travel Tours. 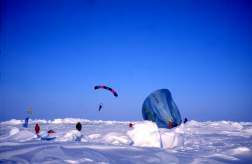 What do you do on a North Pole Expedition. This page will show you all the fun that you're missing. Look Below to Start the tour and just follow the arrows. Every Expedition needs a start. 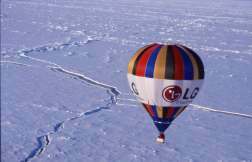 What's on the North Pole, ICE, of course. You can take a Ski Trip. 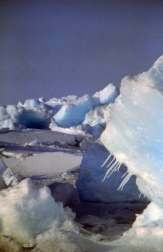 Sleep in a tent on the moving Ice Floe. 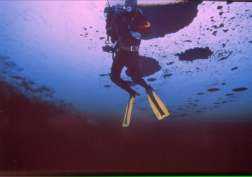 What about some SCUBA Diving. Looking at the top of the World from Underneath its cap. 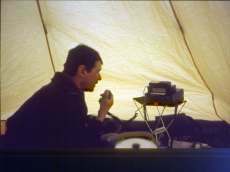 Even North Pole explorers enjoy a warm tent. A fantastic Russian Helicopter gives everyone a ride. Or jump from ten thousand feet. Land in the nice soft snow. Even get married and get your lips stuck together. Be sure to waive at your friends. 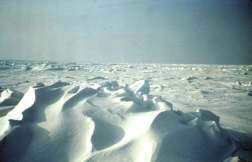 Yes, this is the real Geographical North Pole. Click Here's a book written by Chris himself. 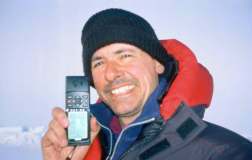 When Christopher Pala first landed at the North Pole, he fell so much in love with it that he took his girlfriend to ride the polar treadmill on what he mischievously called the First Expedition to Nowhere. 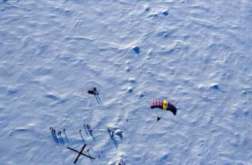 For a week, the couple skied every day to the pole, pitched their tent and drifted away from it as they slept. 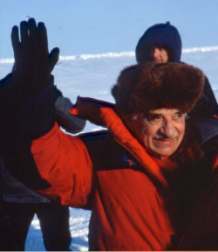 Between his five trips to the pole, Pala used his journalistic skills to peel away the layers of myth surrounding its discovery and capture the untold story of the first men who indisputably stood there. Pala is the first to chronicle the transformation of one of the most remote places on earth into a new Mecca for adventure travelers. 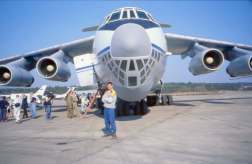 Flying in every April on Russian jets, he joined risk-lovers to parachute over it, balloon across it, attain it on skis and scuba-dive under it. But as he discovers, man's presence at the pole is still ephemeral and there is plenty of opportunity to enjoy the escape from ordinary constraints of time and space provided by this breathtakingly gorgeous place that is not a place. 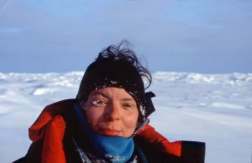 Excerpts of the book have appeared in Condé Nast Traveler, Blue Adventure, Polar Record and other publications. Christopher Pala is a free-lance journalist based in Almaty, Kazakhstan. 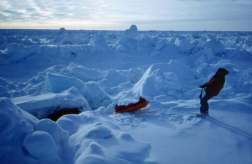 His work with United Press International and Agency France-Presse took him to the Caribbean, West Africa, Russia and Central Asia, but no place captured his heart and mind more than the North Pole.